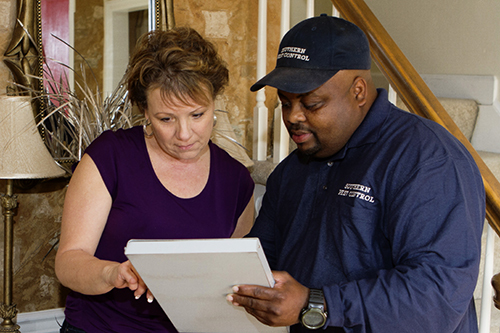 Nashville Pest Control exterminators at Sovereign Pest Control Charter #4825 provide premium residential extermination services to the entire Nashville, Tennessee area. Our Nashville Pest Control exterminators are highly trained and certified with the Tennessee Department of Agriculture. Our Nashville Pest Control exterminators have earned a reputation for their punctuality, friendly customer service and excellent treatment results. Sovereign Pest Control is proud to continue this tradition of excellent customer service to our Nashville Pest Control customers. We are committed to creating a highly effective, family and pet friendly pest control management approach to homeowners. In addition to serving the Nashville area, we are happy to extend our Nashville Pest Control exterminating services to the residents of Cheatham, Davidson, Montgomery, Robertson, Rutherford, Sumner, Williamson and Wilson Counties. Do you suspect an Ant, Flea, Termite or Spider infestation in your home? Tired of those annoying Mosquitoes? Whatever your pest problem, our Nashville Pest Control exterminators will design a custom treatment plan to fit your needs. Discounts are available on Specialty Service Options for Sovereign’s Nashville Pest Control homeowners. Specialty Services include Mosquitoes, Flies, Stink Bugs, Bee Nest Removal, Fleas, Fire Ants, Flea & Ticks Pet Service, Box Elder Bugs, Pantry Pests, and Cicada Killers. If you’re looking for a Nashville Pest Control exterminator you can rely on, contact Sovereign Pest Control today for a quick, no-obligation quote at no cost. 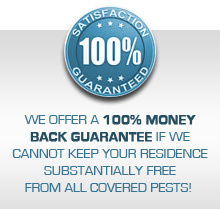 All of our Pest Control, Termite, Flea and Tick service plans come with a 100% money back guarantee. Ask about the $50 discount off yearly service for every referral that becomes a service plan customer. Refer your Nashville friends, family and neighbors and save on your service. All you have to do is submit the information on the referral form.